Under the covers, you have two options for SVG output. If you choose Browser as the output format, the only action available is Preview. If you choose SVG as the output format, the only action available is Save On Disk. This does not use the Genero Report Viewer. The Genero Report Viewer for HTML5 is used to display reports that are in the SVG format. If you select SVG as the output format. 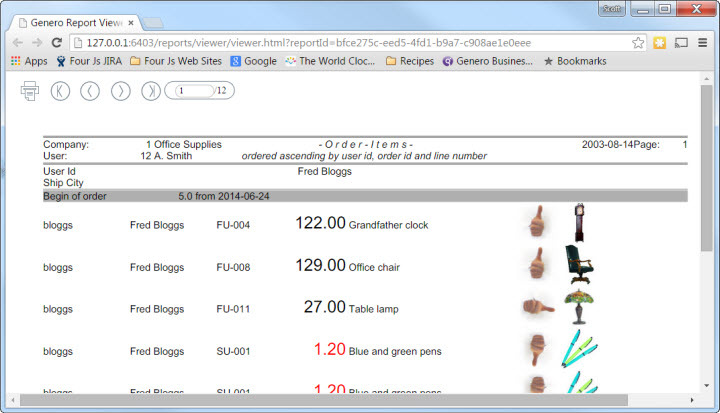 In addition to displaying the report, the report viewer provides navigation options. It supports direct navigation to a specific page. The Print icon prepares the report in a single HTML page that you can then print using your browser's print functionality.